I finally got a chance to work on the improv quilt again. I didn’t actually lay it out on the floor, but laid out the wide extended border on my cutting table and began assembling “sections” along one side – starting with one of the equilateral triangle elements and adding bordered blocks, and plain blocks, and pieced blocks the same width, attached to one another with whatever width sashing make the section come out even. I had to sew some partial seams as I was putting the pieces I’d made together (I got good at that on the medallion quilt), then opened them to attach the next segments. I’d say I got about 3/4 of the quilt top assembled. I still have to make a couple of blocks to complete the improvisation. Not sure what they’ll be yet but some bit of piecing I haven’t tried yet. I’ve got to go looking for fabric to back the quilt in the next few days. 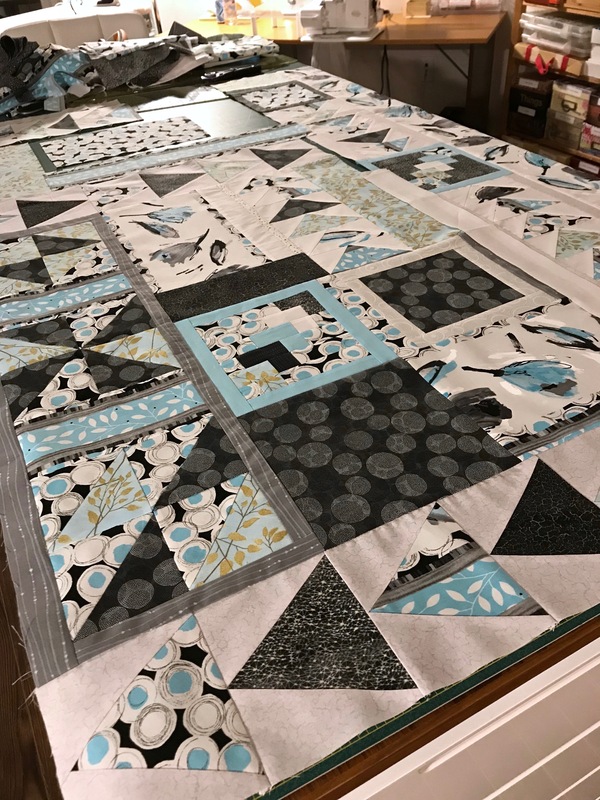 I have to have this quilt top completed over the weekend because the improvise a quilt class meets on Tuesday and I have to have this finished. I’m hoping I’ll be able to have the quilt sandwich assembled so I can demonstrate quilting in the hoop to the gals. The final (3rd) class, two weeks later, will be binding the quilt, and adding a label to the back. In other words I want these quilts DONE and not left as UFOs (Unfinished Objects) which is so often what happens to class projects for these gals.